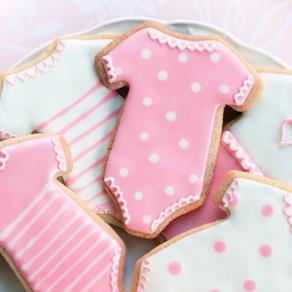 These look elegant but are so easy! To make, use a vegetable peeler to peel strips from your cucumber skin. Leave some of the green showing so that your cucumber looks striped. Then slice into generous portions. Top with lunch meat, hummus, crab salad, or chopped veggies. Optional: place cucumbers on a slice of toast cut into a circle and sprinkle with fresh parsley. Refrigerate to chill before serving. 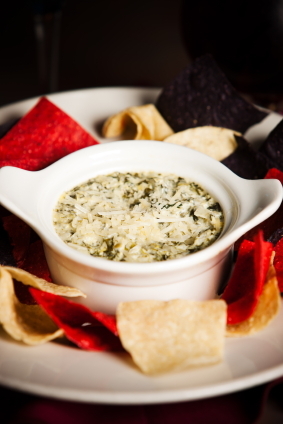 Add a little color to your holiday menu by serving up spinach and artichoke dip with red and blue corn tortilla chips. 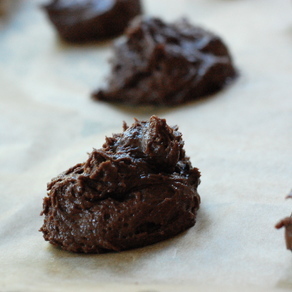 To make the dip, start by preheating your oven to 350 degrees. In a medium bowl, mix together 1 (10 oz) package of frozen chopped spinach, 1 (14 oz) can of artichoke hearts (drained and chopped), 1/2 cup sour cream, 1/2 cup mayonnaise, 1 cup grated Parmesan cheese, and 2 cups Monterey Jack cheese. Transfer mixture into baking dish and bake in oven for 15-25 minutes, or until cheese is melted and bubbly. Top with grated Mozzarella or Monterey Jack cheese. 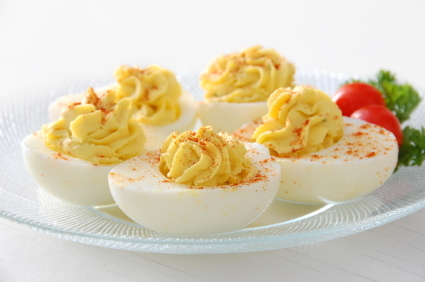 Deviled eggs are always a crowd pleaser, and they’re so simple anyone can make them. Prepare hard-boiled eggs by boiling eggs on the stove for 10-12 minutes. Remove eggs from water, cool, and then peel. Slice eggs in half lengthwise and remove the yolks. Place the yolks in a mixing bowl. Using a fork, mix egg yolks with 1 tablespoon of Dijon mustard, and 1/4 cup of mayonnaise. Salt and pepper to taste. Optional: Add finely chopped onion, celery, green onion, or fresh parsley. Spoon the egg yolk mixture back into the egg whites. Sprinkle with paprika and chill in the fridge. Making hummus from scratch is really easy and will save you money too. All you need to make hummus is 1 (16 oz) can of garbanzo beans (or chickpeas), 1/2 cup of tahini (you may need to look at your health store for this or some grocery stores carry this on the peanut butter aisle), 3-5 tablespoons of lemon juice, and 2 cloves of garlic (chopped). Combine all the ingredients in a food processer or blender. Then transfer mixture to serving bowl. Add salt and pepper to taste. Sprinkle 1-2 tablespoons of olive oil on top and garnish with paprika. 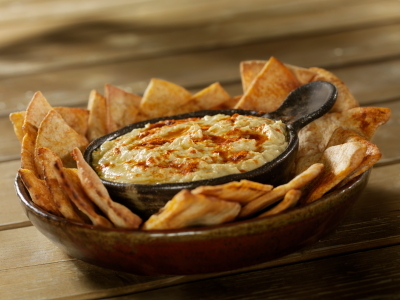 Serve with toasted pita shells cut into triangles. 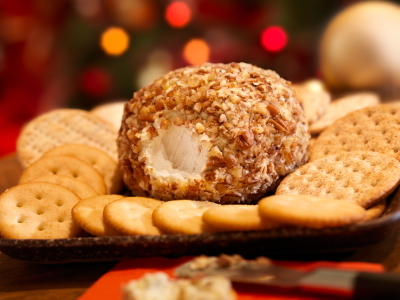 A cheese ball is a popular holiday appetizer, but not everyone knows just how easy this is to make. There are a few ways to make this. Here is one quick and easy recipe. Combine 2 (8 oz) packages of cream cheese, 1 (1 oz) package of ranch dressing mix, and 2 1/2 cups of shredded sharp cheddar cheese. For a more traditional cheese ball that’s also easy, mix 2 (8 oz) packages of cream cheese, 1 tablespoon of Worcestershire sauce, 2 teaspoons of grated onion, 1 teaspoon of minced garlic, and 2 cups of shredded sharp cheddar cheese. Blend cheese mixture (from either recipe) with a hand mixer. Refrigerate mixture until firm. Once chilled, shape into a ball and roll the ball in chopped pecans. Cover cheese ball with plastic wrap and place back in the fridge for at least 24 hours. Serve with crackers. 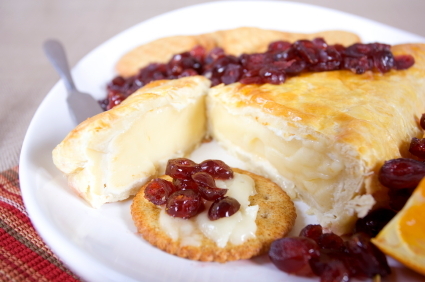 With just a few ingredients, you can whip up this impressive holiday Brie en Croute. All you need to make this is 1 sheet of frozen puff pastry (thawed), 1 wheel (8 oz) of Brie cheese, 1 egg, and a tablespoon of water. Preheat your oven to 375 degrees. Unfold your pastry sheet and place on a lightly floured counter. Put the Brie cheese inside the pastry sheet and fold the pastry sheet around the cheese to cover it. Using a whisk mix the egg with water and then brush the mixture over the pastry to seal the seams. Bake in the oven with the seam-side down for around 20 minutes or until golden brown. Serve with cranberry relish on top. To make cranberry relish, combine 1 1/2 cups of cranberries (frozen or fresh) with 1 cup of water, and 1 cup of sugar in a sauce pan. Bring to a boil. Then reduce heat and let simmer for about 10 minutes, stirring occasionally. Allow to cool and spoon over pastry. 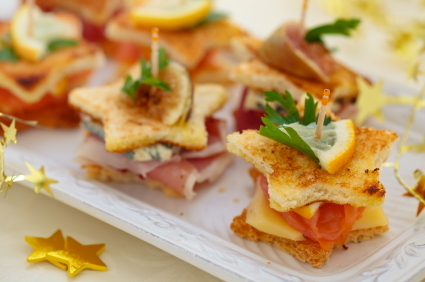 Use a cookie cutter to create Christmas-shaped tea sandwiches. Toast some bread and cut it into shapes. 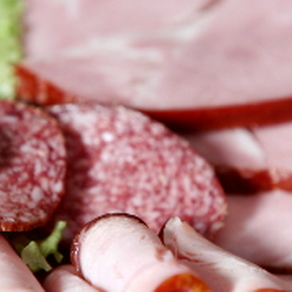 Then add sliced meats, cheeses, or spreads to your sandwiches. Garnish with parsley and lemon wedges. 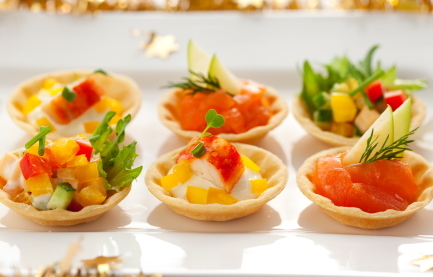 Fill tartlets with chopped veggies, seafood salad, or cheese spreads for a cute holiday appetizer. If you can’t find premade tartlets, you can make them yourself by cutting refrigerated pie crusts into circles and then forming them inside a muffin pan. Follow baking instructions on package. 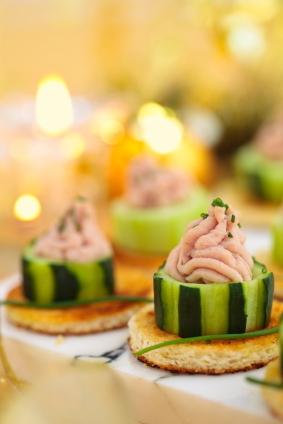 Serve these at your next holiday party and watch them get gobbled up! 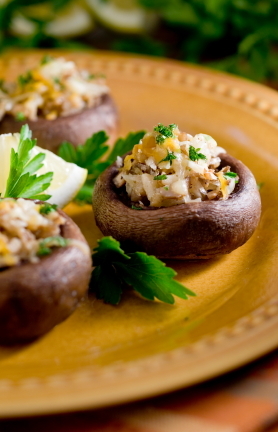 There are so many ways to make stuffed mushrooms but here’s one easy recipe for you to try. Mix 1 (8 oz) package of cream cheese, 2 tablespoons of Parmesan cheese, 1 (6 oz) can of crab meat, and 1 to 2 cloves of garlic (minced). Remove the stems from about 24 crimini or mini portobello mushrooms. Fill mushrooms with mixture and bake at 350 degrees for around 20 minutes. Garnish with chopped parsley.